Once upon a time in Rushmore McKenzie’s life, the Midwest Farmers Insurance Group paid a reward of $3,128,584.50 for catching an embezzler giving Midwest a hard time. 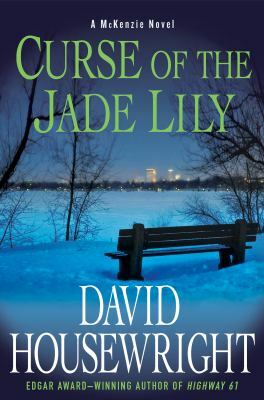 On a cold winter’s morning six years later, the man who gave McKenzie the check, Vincent Donatucci, arrives at Mac’s Falcon Heights home with an offer to pay him $125,000.00 more to act as go-between in a matter involving the theft of the Jade Lily. An artifact known as the Jade Lily -insured by Midwest for $3.8 million bucks- was stolen from the City of Lakes Art Museum the night before. The ransom demanded by the “artnappers” (as Donatucci calls them) is a third of its insured value. The fee Donatucci offers McKenzie is ten percent of that ransom, but Mac just laughs it off at first. Why risk his life for money when he already is set for life with it? Then Donatucci lets McKenzie in on something else: the thieves have specifically requested McKenzie to be the go-between. Astonished, McKenzie nibbles at the bait Donatucci has dangled before him, but Donatucci abruptly feigns indifference to the whole affair knowing all the while he has McKenzie hooked. McKenzie finally agrees to take the job for the offered fee plus expenses. The board of the City of Lakes Art Museum tells McKenzie they want the theft kept hush-hush; they have not informed the police out of fear of adverse publicity that might affect the museum, especially when it comes to displaying items on loan from their owners. The Jade Lily is their latest one, on loan from a wealthy collector from Chicago. They also give him a possible suspect: Patrick Tarpley, the head of security at the museum whom they suspect pulled an inside job on them. Then a phone call from the thieves arrives during the board meeting. McKenzie then finds himself on a walk around Minneapolis’ famed Lake Calhoun with a red rose in hand as a bitter cold wind sweeps the lake and its surrounding walking and biking trails. The rose is to identify him to the thieves, but nothing cordial takes place when two thugs jump him on the west side of Calhoun, slap handcuffs on him, and spirit him away in a van to a place where they are met by the lovely Heavenly Elizabeth Petryk, a woman McKenzie last saw during a search around Saint Paul for a stash of gold left behind by Depression-era bank robber Frank “Jelly” Nash. But Heavenly freely reveals that she is not the thief, but before she explains what her angle is involving the Lily, she can’t resist telling McKenzie all about the Jade Lily, especially how death and other misfortunes have befallen practically all who have owned it. Finally, Heavenly explains she represents a woman who once owned the Jade who wants it back and would like Mac to give it to her, not the museum, when he buys it back. Nothing doing, McKenzie tells her, and he is released. Just in time to get a call from the thieves demanding to know what that was all about. From that point on McKenzie finds himself involved in a case with so many twists, turns (and U-turns)it finally makes Mac comment to Nina that everybody and his brother seems to be either after the Lily or want him to give it to them. Curse or no curse, it will take all Mac McKenzie has to solve this one, and then some; which is just the thing to keep the pages turning for readers of this latest whodunit by David Housewright.